The name Macedonia is derived from the Ancient Kingdom of Macedon, between the seventh and the second centuries, B.C. The borders of Macedonia in ancient times were much wider than they are today, and encompassed parts of Greece and Bulgaria. The name Macedonia is disputed and is not accepted by the Greeks. They claim that “Macedonia” belongs to their region and they simply won’t accept it as the country’s name. Greeks from that region refer to themselves as Macedonian, although they are not affiliated with the ethnic Slavs that make up the majority of Macedonians today. Alexander the Great was the King of Macedonia in 336 B.C. He was the first, worldwide conqueror who extended his empire across Greece and Persia and to India and Egypt. He is a hero to both Greeks and Macedonians. Most Macedonians refer to the region where they live as Vardar Macedonia, the Greek part as Aegean Macedonia and the Bulgarian part as Pirin Macedonia. The Greeks refer to Macedonians as Skopjeans. Because of the dispute with the Greeks, the United Nations will only refer to them as the Former Yugoslav Republic of Macedonia or (FYROM.) However, 130 countries accept them as simply, the Republic of Macedonia. There has been some discussion to change the name in order to end the feud with Greece, but this has not yet occurred. Macedonia is a small, landlocked country, located in the south-central Balkans. Its neighbors are Kosovo and Serbia to the north, Greece to the south, Bulgaria to the east and Albania to the west. The country is mountainous with active fault lines, along which, earthquakes frequently occur. The capital city of Skopje was nearly leveled by a devastating earthquake in 1963. The capital city is located on the upper course of the Vardar River and an important historical location on the north/south trade route between Belgrade and Athens. It is the country’s political, cultural, economic and academic center and has been inhabited since at least 4000 B.C. The largest cross in the world, called, the Millennium Cross, is located and lit above the capital city, on top of Vodho Mountain. Mother Theresa is most likely Skopje’s most famous citizen. Although she was Albanian, she was born in Macedonia in 1910. There is a museum in Skopje in her honor. She was a Nobel peace prize winner in 1979 for her work in India with the poor. This year on September 4th, 2016 she will be canonized as a saint. The country has three tectonic lakes, created by the mobility of the earth’s crust. Lake Ohrid is one of the deepest and oldest in all of Europe. It is an UNESCO World Heritage site. It is estimated that this lake is two to four million years old. It has over 200 species of plants and animals unique to the lake and preserves an ecosystem that is of worldwide importance. The area between two lakes, the Ohrid-Prespa Transboundary Reserve, was added as an UNESCO Biosphere reserve. Surrounding villages on the shores of the lake are some of the oldest settlements in Europe. The city of Ohrid, the largest city on the lake, is notable for once having 365 churches; one for each day of the year. It has been referred to as “The Jerusalem of the Balkans.” The area is one of Macedonia’s most popular tourist destinations. Macedonia was part of the Ottoman, Roman and Byzantine Empires. It was later part of Bulgarian and Serbian Empires, and eventually became part of Yugoslavia. Macedonia declared independence from Yugoslavia peacefully, without shedding any blood, in 1991. Since their independence, Macedonia has not had an easy time. The dispute with Greece is not just about the name. Greece has caused major economic ramifications for this new country as well. The controversy has affected Macedonia’s ability to attract foreign investors and their capacity to begin economic reforms. Aside from the clash with Greece, Macedonia has also had issues with their largest minority group, the Albanians. Nearly 25 percent of the population is Albanian. There have been a few serious uprisings between the two factions. The most recent was in 2015, when NATO intervened and called for calm after allegations arose about the prime minister’s illegal wire-tapping and abuse of power. The country has a very high unemployment rate, as high as 30 percent. However, there is a bit of a grey, underground market that claims it is not as bad as the statistics show. Today they have found new trading partners and the economy has slowly begun to prosper. Their main exports are iron, steel, clothing and food products. Agriculture also plays an important role in exports, as they have rich, fertile lands in between their numerous mountain peaks. They grow tobacco, fruits, especially apples and grapes, vegetables, wheat, rice and corn. Dairy culture is also prevalent, as well as a robust wine industry. The majority of the Macedonian population, about 70 percent, are Orthodox Christians, with the exception of the Albanian minority population, along with Turks and Romas, who are of Islamic faith. The official language is Macedonian, which is closely related to Bulgarian and Serbo-Croatian and is written in the Cyrillic alphabet. The alphabet was developed back in the ninth century by two Macedonian brothers, Saint Cyril and Saint Methodius. The Macedonian language was not officially recognized until 1946, when it became a republic of communist Yugoslavia. As we look into the cuisine of Macedonia, it clearly has many influences. It is a combination of Mediterranean and Middle Eastern gastronomy, yet shares many characteristics of other Balkan cuisines. The national dish is called, Trave Gravce, which literally means, “beans cooked in a skillet.” It is a thick, chunky, bean stew cooked in special Macedonian earthenware. Every family has their own recipe for this hearty dish. The choice of vegetables and spices can vary but it always includes fresh, Macedonian paprika. Other popular main dishes, include many of the recipes we have enjoyed from other nearby countries. I have listed them here with links. They are dishes such as Mousaka, a delicious casserole we made for Cyprus, Polneti Piperki, a stuffed pepper that we enjoyed for Bosnia, Sarma, made with cabbage or grape leaves, which we made for Armenia and Lithuania and Burek, a spinach pie we had for Albania. Any of these dishes would be an appropriate main course for Macedonia as well. Macedonia has an important coffee culture, with Turkish coffee being the most popular. There are literally over 5000 coffeehouses and bars called, the Kafeana, and they are the most popular places to go out, have a drink and socialize. It is an integral part of Macedonian life. The national drink is called mastika. It is consumed as an aperitif, usually served over ice and enjoyed with appetizers. It has an alcohol content of about 45 percent, a taste, not unlike brandy and is usually made from grapes, raisins, plums or figs. Another popular drink is called rakija, a fruit brandy, which many Macedonians make themselves and which has a very high alcohol content; some as high as 80-90%. They also make really good wine. The Tikvesh wine region has been making wine since the fourth century. This is a beautiful area of the country located in the heartland, with never ending fields of grapes and wineries. 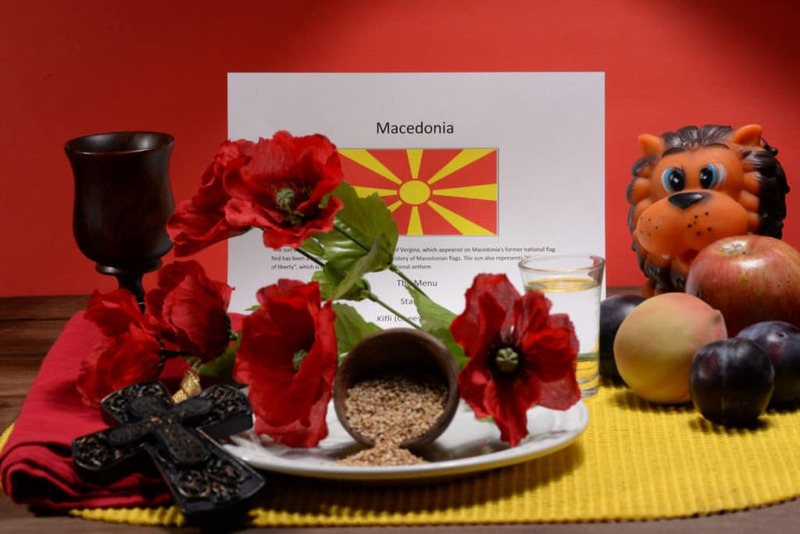 We set the table with the colors of the Macedonian flag; red and yellow. They have a great looking flag. It is a bright, yellow sun on a red background that is reminiscent of looking at a vibrant sun burst. The sun is a simplified version of the star of Vergina, and is considered the “New sun of liberty.” Red poppies adorned the table, as they are the national flower, a lion represented the national animal, apples and peaches, along with sesame seeds, signified the importance of agriculture in the country and finally, a wooden wine goblet, was an homage to their wine industry. Our first course began with a toast, “Nazdravye”, which is how they say “Cheers”, in Macedonia. Our first, two courses were served together. 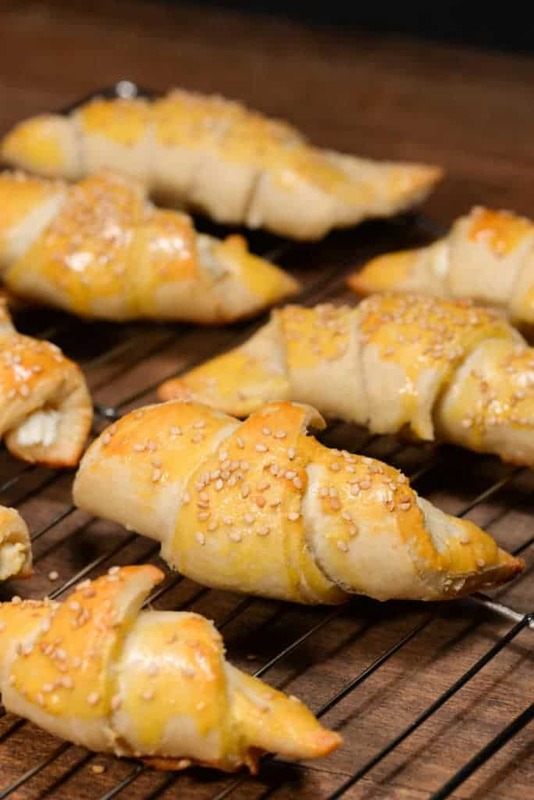 Kifli, were these amazing cheese rolls, served hot out of the oven and sprinkled with sesame seeds. They are popular treats and found in nearly every bakery on every street corner of Macedonia. The Kifli were served with Tarator; a cold cucumber soup, made delightfully creamy with yogurt or kefir. 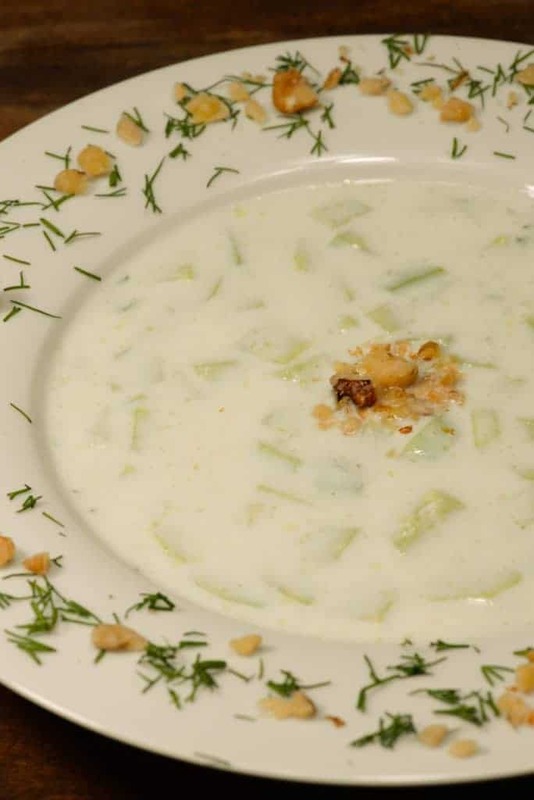 It is garnished with walunts and dill and is a perfect, refreshing soup for a hot summer day! For our main course we had Pastrmailija. This is a superb meat pizza. It is typically made with either cured lamb or pork. We made ours with pork, spiced up with a little cayenne pepper. It is an oval shaped pizza. The pork pizza was topped with egg and served with hot and mild peppers on the side. 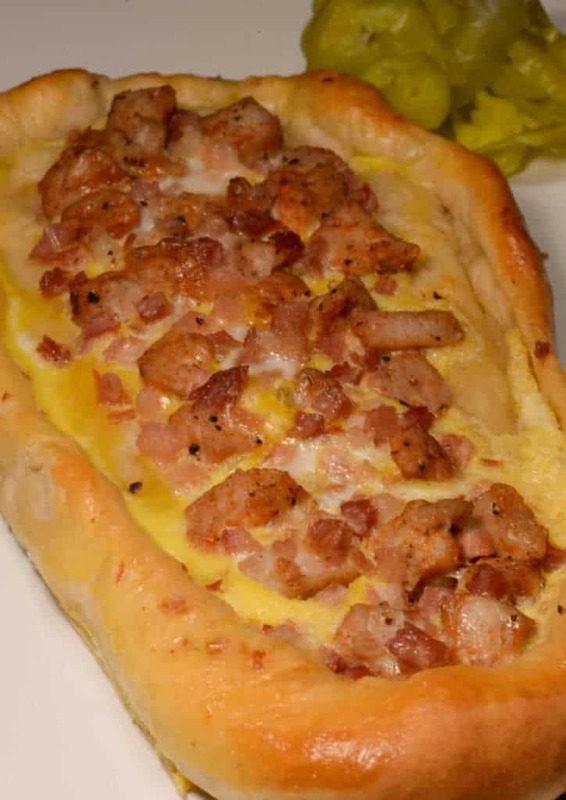 This dish is so popular in Macedonia, they even have a festival each year to celebrate it. We fully understand why; delicious! Shopska Salate was enjoyed, along side the pastrmailija. Shopska salate is served all over the Balkan region. 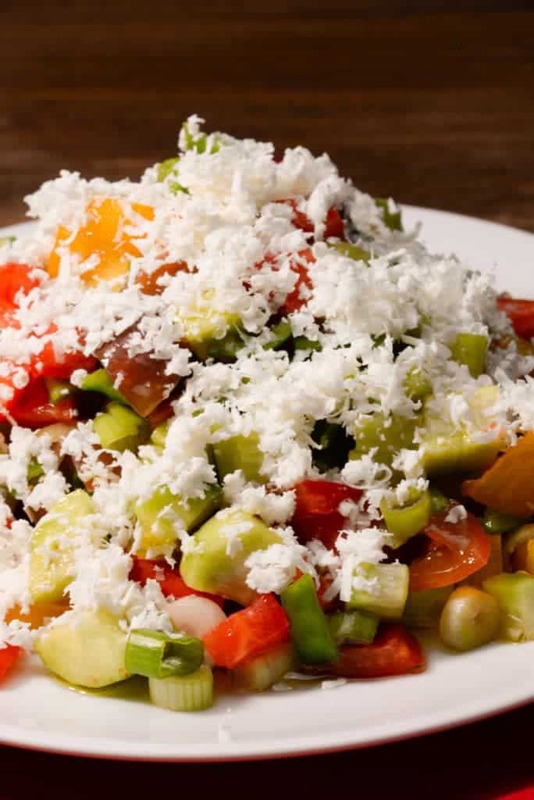 What sets the Macedonian shopska salad apart is the copius amounts of cheese served over it. Sirene is the white cheese, typically used, or a sheep feta which is how we had ours. This salad, simply served with a little extra virgin olive oil, is one of our all time favorites. 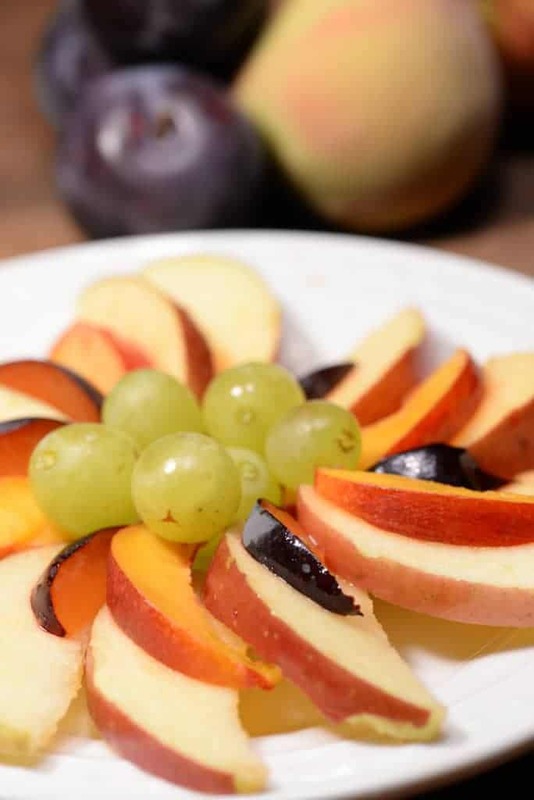 For dessert, we had a simple plate of fruit; apples, plums, nectarines and grapes. This fruit plate may often times be drizzled with a sugary syrup or even some alcohol, but we enjoyed ours just plain, sweet and lovely, all by itself. After our meal we went out to look at the stars and the full moon. Kokino, in Macedonia, is the fourth oldest astronomical observatory in the world. There was a man who could not decide which of two women he should marry. So, the man planned to marry both women on the same day, but at different times. When the first wedding was in progress, the woman, who was to marry the man later, went to see who was getting married on the same day that she was. When she saw her future husband marrying another woman, she cursed all in attendance at the wedding and turned them into stone. The site is known as, the petrified wedding. So happy you like it, thanks for being part of the journey! Your explanation of the Greek and Republic of Macedonia dispute is incorrect; it has been over-simplified and is very one sided. Hello Greg and thank you for your comment regarding my post on Macedonia. If you follow our culinary journey around the world you will see that I give brief over views about the country and the history. My accuracy is important to me and you have pointed out that I am incorrect and one-sided regarding the dispute with Greece. I would appreciate knowing how I can better describe the conflict being fair to both sides. Please keep in mind that my post and purpose is not about the dispute/conflict, it is to have a better understanding of the people who live there. I did mention that the dispute existed. Thank you kindly for taking the time.